Welcome to the German States sale. We have lots of material from the German States, so if there is anything you want or need and do not see it please just send email. If we have an item that you would like a scan of, or there is an item which you would like to see a higher resolution scan of, please send email and we will be happy to work with you. This page will continuously be changing with new items being added and some items being removed. Please bookmark this page. We have tried to gather a wide variety of material in various conditions to suit every range of collector. For multiple item orders discounts can be arranged. Care has been taken to try and weed out all forgeries and reprints. If you spot one that we missed please let us know. We will be happy to take back any of these items. For a discussion on forgeries please read the following article: The Simplicity of Basic Forgery Detection. The sale is broken down into States referenced by Scott's number (and possibly Michel to further describe a stamp). If a scan is available the Scott number will be a link. Asking price is next to the description. Have fun and let us know what you think. Remember, this is just a small sampling of what we have. If there is something in particular you are looking for and do not see it, please send email. Enjoy the sale and please feel free to leave feedback. Scott #2: Nice stamp with a nice cancel from Wiesenthal (#163). Stamp cats $21 (with cancel). Sales Price $10. Scott #2: Nice variety with various ring cancels. Stamp cats $13. Sales Price depends on condition and cancel: $5-8. Scott #3: Two copies. Both are nice fresh copies with nice cancels. Cat price for the stamp is $45 and the one pictured has cancel #1 from Aach worth 100DM. Sales Price $45 with Aach cancel and the other copy is $20 as it has one close margin. Scott #3: Choose one. Both are nice stamps, one cut close on the left and the other nicely cut. Stamp cats $45. Sales Price $20 or $30. Scott #4: A great looking stamp. An extremely fresh looking stamp with a perfect cancel. Stamp cats $22.50. Sales Price $16. Scott #4: A number of examples with different ring cancels and color variations. Good for the specialists. Stamp cats $22.50. Sales Price depends on stamp and cancel: $9-15. Scott #4a: A hard to find color. 2 corner faults, otherwise a very nice stamp. Stamp cats $190. Sales Price ask. Scott #6: Nice items to choose from. One with a very nice #134 cancel (90DM). Stamp cats $30. Sales Price ask. Scott #1: Nice selection with various cancels to chose from. Stamp cats $6.75. Sales Price ask. Scott #7: Various items with some nice circle cancels. Stamp cats $6.75. Sales Price ask. Scott #8: Nice blue variety of this stamp. Good margins and selection. Stamp cats $32.50. Sales Price $20. Scott #8: Nice copies with some nice cancels. Stamp cats $32.50. Sales Price $20. Scott #9: Many to chose from and some have nice ring cancels for the specialists. Stamp cats $21. Sales Price ask. Scott #9: Good color and some desirable cancels on these 6kr black and yellow items. Stamp cats $21. Sales Price ask. Scott #10: One side cut. Rest of the stamp is in very nice shape with a nice Vohrenbach town cancel (17 DM). Stamp cats $24. Sales Price $9. Scott #10: 2 to chose from. One has some trimmed perfs and the other is very nice. Good color and presentation. Stamp cats $24. Sales Price $9 or 15. Scott #12: Damaged copy with nice Kehl cancel (7DM). Stamp cats $17. Sales Price $4. Scott #12: Nice color and cancels. One stamp has some bad perfs. Stamp cats $17. Sales Price $6 or 12. Scott #19: Various items to chose from. Condition varies. Stamp cats $13. Sales Price ask. Scott #20: Inexpensive stamps. Check out the cancels and see if there is anything you like. Stamp cats $1.40. Sales Price ask. Scott #20: Various items and condition. One stamp has a #5 number cancel. Stamp cats $1.40. Sales Price ask. Scott #22: One #22 and one #22a (damaged). Good color variations for the specialists. Total cat $97.50. Sales Price $30. Scott #22: Various copies in varying condition. All used. Stamp cats $22.50. Sales Price ask. Scott #23: Nice color and good perfs. Cats $27.50. Sales Price $10 . Also, one spacefiller version with nice cancel for $4. Scott #1: One mint and one used. Check the color variations. Good items and good for the specialists. Total cat $42.50 (assuming lesser color variation). Sales Price $32. Scott #23a: A beautiful stamp! No faults and good color. A hard to find stamp in this color. Stamp cats $175. Sales Price $120. Scott #23a: Nice copy of the harder to find color variation of this issue. Stamp cats $80. Sales Price $40. Scott #24: Key stamp. Lower left corner clipped. Nice Endingen cancel and good perfs and color. Stamp cats $600. Sales Price ask. Scott #25: There are lots of copies of this stamp up on various Internet auctions. However, the stamps tend to be forgeries and the cancels as well. This stamp is authentic and the cancel looks good as well. This is a key stamp for this state. Please view scan. Has a couple bad perfs at the top. This stamp cats $1500. Sales Price $600. Scott #26: An inexpensive stamp with a number of color variations for the specialists. Stamp cats $4.50. Sales Price $2. 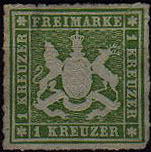 Scott #26: Various copies of this 1KR green stamp. All used, nice cancels. Stamp cats $4.50. Sales Price $1.50. Scott #27: A number of copies to chose from. Some color variations. Stamp cats $2. Sales Price $1. Scott #27: Various used copies of this stamp. Some cancels and good color. Stamp cats $2. Sales Price $1. Scott #28: Good color variations. A good lot for the specialists to pick over. Stamp cats $37.50. Sales Price ask. Scott #28: Various items of this issue in nice condition. All used. Stamp cats $37.50. Sales Price $15. Scott #LJ1-3: Mint copies of Rural Postage Due Stamps. A nice lot of some unique stamps. Sales Price ask. Scott #2: A number of copies, all used, many with desirable cogwheel cancels. Stamp cats $2.25. Sales Price ask. Scott #3: Very good margins and extremely fresh look with virtually no cancel. This is the scarcer version of the 6k (incomplete circle) brown. Cats at $200. Sales Price $160. Scott #4: Copies are all average and used. Stamp cats $19. Sales Price $4-6. Scott #5: A number of items, all used, and many with desirable cogwheel cancels, ranging in value from 5-60DM. Stamp cats $11. Sales Price ask. Scott #6: A number of items, many with cancels worth 5-25DM range. Stamp cats $13. Sales Price ask. Scott #9: A number of copies of this nice yellow stamp. All used and some nice desirable cancels. Stamp cats $19. Sales Price ask. Scott #11: Various items all used and many with nice cogwheel cancels from desirable towns. Stamp cats $10. Sales Price ask. Scott #12: Nice assortment of items. Some with cogwheel cancels from desirable towns. Stamp cats $13. Sales Price ask. Scott #13: A nice copy with circle cancel 227 worth 25DM. Stamp cats $60. Sales Price $40. Scott #14: Good color and good margins. Have other copies with 4 large margins (ask for more details on these). Very fresh looking with nice wheel cancel. Stamp cats $125. Sales Price $70. Scott #19: VF stamp with 4 full and wide margins. Nice brilliant color. Stamp cats $11. Sales Price $6. Scott #27a: A very hard stamp to find. This copy has some trimmed perfs but is still a nice copy for any collection. Stamp cats $475. Sales Price $170. Scott #28: Fine stamp with good color (this color is hard to scan). Good perfs and a interesting cancel. Cats at $13.50. Sales Price $6. 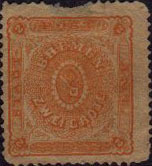 Scott #32: Fine stamp with good color and cancel. Cats at $45. Sales Price $20. Scott #55: Nice color and copy of this inexpensive stamp. Stamp cats $5. Sales Price $2. Scott #76: VF stamp with good color and perfs. Nicely centered. Stamp cats $20. Sales Price $8. Scott #1: VF stamp for this area. Stamp cats $47.50. Sales Price $30. Scott #2: Authentic stamp from a hard to find state. Stamp is in nice condition. Stamp cats $47.50. Sales Price $32. Scott #3: VF stamp reprint of this interesting stamp. Sales Price ask. Scott #4: Good clean copies of this stamp available. Stamp cats $27.50. Sales Price $15. Scott #5: VF stamp reprint of this interesting stamp. Sales Price ask. Scott #4: This is a nice copy for this issue. Good color and design is clean. Stamp cats $350. Sales Price $200. Scott #4b: Nice yellow-green color with nice details. Cut in design on the left. Stamp cats $225. Sales Price $70. Scott #2: A very hard stamp to find. Great color. This stamp has been repaired and it shows from the front. Stamp cats $275. Sales Price ask. Scott #6: VF copies with nice wide margins. Stamp cats $27.50. Sales Price $19. Scott #7: Extra wide margins with no faults. Blankenburg cancel which cats 50DM. A very nice stamp. Cats at $105. Sales Price $70. Scott #10: VF stamp with 4 full and wide margins. Hasselfelde cancel which cats 150DM. Stamp & cancel cats $180. Sales Price $110. 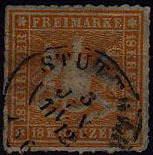 Scott #10: VF stamp with full margins. Thedinghausen cancel which cats 300DM. Stamp & cancel cats $250. Sales Price $175. Scott #11: VF stamp with 4 full margins. Very fine impression with clear break in spandrel below EI. Cats at $225. Sales Price $165. Scott #23: Excellent centering and presentation. Most copies are off centered and scuffed up. A VF item. Stamp cats $30. Sales Price $22. Scott #24: various mint copies with nice margins and appeal. Stamp cats $3. Sales Price $1.50. Scott #26: Nice mint copies of this stamp, with good margins. Stamp cats $7.50. Sales Price $3.50. Scott #1: Authentic copy with nice margins. See scan for upper left is cut close. Stamp cats $90. Sales Price $50. Scott #1: Stamp is authentic. The question is: Have the perfs been trimmed off. If not then this is a nice copy. Stamp cats $750. Sales Price ask. Scott #3: VF stamp with a fresh look and an interesting Ha cancel. Stamp cats $110. Sales Price $75. Scott #9: Nice stamp with good details. No watermark, so it is assumed to be a reprint. Stamp cats $140. Sales Price ask. Scott #9a: Nice stamp with good details. No watermark, so it is assumed to be a reprint. Stamp cats $150. Sales Price ask. Scott #13: Nice stamp with good perfs and cancel. Stamp cats $13. Sales Price $7. Have other copies which bad perfs, ask for special price on these. Scott #14: VF stamp with fresh appearance. Stamp cats $13. Sales Price $9. Scott #14: Fresh stamp with nice cancel. A good copy of this stamp. Stamp cats $18. Sales Price $12. Scott #15: Have a few of these issues, all with various faults. Stamp cats $25. Sales Price ask. Scott #18: Nice copy with good color and clear design. Stamp cats $11. Sales Price $6. Scott #20: VF stamp nice cancel and appearance. Stamp cats $22.50. Sales Price $15. Scott #21: Nice color and condition. Hard stamp to find with watermark. Stamp cats $30. Sales Price $21. Scott #22: Nice stamp with good centering and appearance. Stamp cats $12.50. Sales Price $6. Scott #26: Cut close at top, otherwise, this stamp has good margins and looks post office fresh. Stamp cats $12. Sales Price $9. Scott #26: VF stamp with great centering. A tough stamp to find in this condition. Stamp cats $75. Sales Price $60. Scott #2: A number of copies of this stamp. Some with very nice margins. All used. Stamp cats $7.50. Sales Price depends on condition. Scott #7: This is the watermark variety! Very good margins with no faults. A nice show piece. A must see. Stamp cats $350. Sales Price $270. Scott #8: This is the fine network copy of this stamp. Has nice wide margins and a very fresh appearance. Stamp cats $165. Sales Price $110. Scott #11: A few examples of this in good condition (good margins). Stamp cats $11. Sales Price $6. Scott #12: Nice margins and color. Very nice copies. Stamp cats $37.50. Sales Price $25. Scott #16: VF stamp with nice big margins and good color. Stamp cats $150. Sales Price $110. Scott #16: Appears to be an official reprint. Good appearance and presents well. Stamp cats $75. Sales Price ask. Scott #18: A very nice mint copy with 4 wide margins and a fresh look. Stamp cats $75. Sales Price $55. Scott #18: 2 copies of this used stamp. One with wide margins and the one pictured, which is cut close. Stamp cats $225. Sales Price varies based on condition. Scott #19b: VF stamp with large margins and a nice centered blue cancel which does not affect the design at all. Stamp cats $22.50. Sales Price $18. Scott #20: VF stamp with nice margins. Stamp cats $37.50. Sales Price $25. We have other copies of this stamp, ask about our other prices, which have hugh discounts due to condition. Scott #23: All copies are used with faults. Stamp cats $60. Sales Price ask. Scott #27: VF stamp with nice margins and perfs. Stamp cats $3.25. Sales Price $2. Scott #27a: Nice copy with good looking cancel. Stamp cats $25. Sales Price $16. Scott #27a: Spacefiller. Stamp cats $25. Sales Price $4. 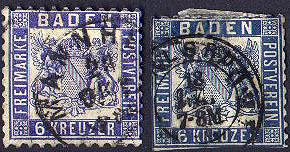 Scott #28: Various stamps in various condition. Most have nice roulettes. Stamp cats $55. Sales Price ask. Scott #2: Nice copy of a lesser known state. A very nice looking item. Stamp cats $60. Sales Price $45. Scott #4: Stamp cut to size (commonly done). Otherwise, a nice piece. Stamp cats $225. Sales Price ask. Scott #6: Very clean and fresh copy. Stamp cats $30. Sales Price $22. Scott #1: Nice stamp with roulettes and ninc cancels. Stamp cats $15. Sales Price $7. Scott #6: various items in average to slightly faulty. Some nice cancels. Stamp cats $9. Sales Price $3. Scott #7: Nice color and stamp with slight thin upper margin. Stamp cats $7.50. Sales Price $2.50. Scott #8: Great orange color. Cut left margin, otherwise a very nice stamp. Stamp cats $37.50. Sales Price $13. Scott #18: Some nice copies of this stamp. Some contain some nice cancels. Stamp cats $9. Sales Price $3-4. Scott #LJ1: Rural Postage Due Stamps form 1862. Nice copies all mint. Stamp cats $5.75. Sales Price $3. Scott #LJ2: Rural Postage Due Stamps form 1862. Nice copies all mint. Stamp cats $3.50. Sales Price $2. Scott #LJ3: Rural Postage Due Stamps form 1862. Nice copies all mint. Stamp cats $35. Sales Price $21. Scott #1: Nice copy of this stamp. Have type 1 and 3 copies. Stamp cats $27.50. Sales Price $18. Scott #2: Hard to find item. Shown is a type 1 copy. Stamp cats $90. Sales Price $45. Scott #19: VF color and cancel. A sharp stamp and a good item for this area. Stamp cats $52.50. Sales Price $35. Scott #20: VF color and cancel. A sharp stamp and a good item for this area. Stamp cats $57.50. Sales Price $38. Scott #21: Sharp color but has a dark area on upper right. Still a clean copy for this area. Stamp cats $22.50. Sales Price $10. Scott #22: A very nice item. Good clean color. Stamp cats $22.50. Sales Price $13. Scott #23: Nice stamp with some paper stuck on the bottom. Stamp cats $8. Sales Price $3. Scott #24: Nice color and centering. Stamp cats $10. Sales Price $5. Scott #1: Very fresh copy with 4 margins. Usually found used. Stamp cats $110. Sales Price $75. Scott #3: Some nice used copies with good color and nice circle cancels. Stamp cats $10. Sales Price $6. Scott #4: Nice early Prussian stamps with good color, nice cancels and good margins. Stamp cats $15. Sales Price $9. Scott #6: Very faulty with nice cancel. Stamp cats $37.50. Sales Price $4. Scott #13: Very brilliant color and a number in very nice condition. Stamp cats $13. Sales Price $8. Scott #15: Various condition. Some have brilliant color. Stamp cats $15. Sales Price ask. Scott #17: Inexpensive and a good way to get started into Prussia. Stamp cats $.75. Sales Price $.50. Scott #18: VF copy of this stamp. Nice fresh color. Stamp cats $10. Sales Price $6. Scott #18: Used copies with great cancels. Nice inexpensive stamps to add to any collection. Stamp cats $2. Sales Price $1. Scott #20: A number of copies all used with nice copies. Stamp cats $2.50. Sales Price $1. Scott #20a: Nice copy of this scarcer color variety. Stamp cats $32.50. Sales Price $18. Scott #5: Nice margins and color on these stamps. Stamp cats $7.50. Sales Price $4. Scott #9: Nice mint copy of this 1/2G item. Good margins and appearance. Stamp cats $10. Sales Price $6. Scott #9: Used copies with great cancels. Nice inexpensive stamps to add to any collection. Stamp cats $2.25. Sales Price $1. Scott #10: Used copies with great cancels. Nice inexpensive stamps to add to any collection. Stamp cats $2. Sales Price $1. Scott #14: Nice margins and color on a key stamp for the area. A very nice copy. Stamp cats $250. Sales Price $200. Scott #14: A very nice copy with nice margins. A few cuts in the margin only. Stamp cats $250. Sales Price $160. Scott #15: Mint copies with very fresh look. Nice inexpensive stamps to add to any collection. Stamp cats $1.50. Sales Price $1. Scott #17: Very used nice copies. Some of the cancels are very desirable and are worth 30-50DM. Stamp cats $1.90. Sales Price ask. Scott #17: Nice mint copy of this 1/2G item. Good margins and appearance. Stamp cats $1. Sales Price $.75. Scott #18a: Dark blue mint copies of this 1863 issue. Good color and margins. Stamp cats $11. Sales Price $7. Scott #18a: A nice used copy of this dark blue item. Stamp cats $22.50. Sales Price $15. Scott #19: Nice color and margin on this 1863 bister colored piece. Stamp cats $7.50 used. Sales Price $4. Scott #20: Good color and perfs on this nice stamp. Margin on the right is tight, otherwise, a nice item. Stamp cats $45. Sales Price $20. Scott #10: Clean copy from Schleswig. Stamp cats $32.50. Sales Price $22. Scott #13: Nice copy with margins on all sides. VF for the area. Stamp cats $30. Sales Price $21. Scott #14: Nice clean copy. Close margins. Stamp cats $32.50. Sales Price $22. Scott #6: Nice copies with good color and circle cancels. Stamp cats $22.50. Sales Price $12. Scott #7: Nice color and margins for this early North District issue. Stamp cats $20. Sales Price $10. Scott #12: Cut close on top. A typical copy for this area. Stamp cats $75. Sales Price $30. Scott #13: Hard to find stamp. This stamp has been repaired and has a bad ll corner. Stamp cats $300. Sales Price ask. Scott #14: Have some mint copies of this stamp. Low cat and affordable. Stamp cats $1.50. Sales Price $.75. Scott #15: Used copy with 2 corner faults. Nice cancel. Stamp cats $45. Sales Price $10. Scott #17: Great color and cancel. Thin uppe right corner. Stamp cats $35. Sales Price $18. Scott #25: Have some mint copies of this stamp. Low cat and affordable. Stamp cats $1.50. Sales Price $.75. Scott #29: VF stamp with 4 margins showing the colored rouletting. Good cancel. A choice copy. Stamp cats $165. Sales Price $100. Scott #29: Have some mint copies of this stamp. Low cat and affordable. Stamp cats $1.50. Sales Price $.75. Scott #31: VF stamp with 4 margins showing the colored rouletting. Interesting cancel on this scarce stamp. A choice copy. Stamp cats $750. Sales Price $300. Scott #31: Have some mint copies of this stamp. Low cat and affordable. Stamp cats $1.50. Sales Price $.75. Scott #32: Have some mint copies of this stamp. Low cat and affordable. Stamp cats $1.50. Sales Price $.75. Scott #42: A number of copies. Some faulty others nice. Stamp cats $12. Sales Price $2/faulty 6/nice. Scott #47: Very fine mint copy with good margins and color. Stamp cats $13. Sales Price $9. Scott #47: A number of used items in various condition. Stamp cats $10. Sales Price $3. Scott #50: Nice color and cancel. Cut close, which is typical. Stamp cats $67.50. Sales Price $32. Scott #51: Nice stamp with a couple of cuts in the margin. Design is clean with a nice cancel. Stamp cats $150. Sales Price $90. Scott #52: Nice color and fresh look. Stamp cats $1.50. Sales Price $1. Scott #52: A nice copy with a nice cancel. A key value for the area. Stamp cats $400. Sales Price $200. Scott #52: Key value with SON cancel. If cancel valid this is a key issue. Stamp cats $400. Sales Price $250. Scott #59: Fine stamp with town cancel of 220. Nice color and clean. Stamp cats $30. Sales Price $15. Scott #60: Have some mint copies of this stamp. Low cat and affordable. Stamp cats $1.50. Sales Price $.75. Scott #61: Have some mint copies of this stamp. Low cat and affordable. Stamp cats $1.50. Sales Price $.75. Scott #62: Have some mint copies of this stamp. Low cat and affordable. Stamp cats $1.50. Sales Price $.75. Scott #63: Have some mint copies of this stamp. Low cat and affordable. Stamp cats $1.50. Sales Price $.75. Scott #2: Various items in good condition. Some have blue cancels. Stamp cats $4.50. Sales Price $2.25. Scott #4: Nice copies of this early issue. Good margins and color. Stamp cats $37.50. Sales Price $24. Scott #6: A dnagerous copy with a cut upper left corner. Stamp cats $675. Sales Price $90. Scott #16: A nice copy of this 1859 imperf. Stamp cats $135. Sales Price $75. Scott #17: Nice color and look on this 1859 imperf. Stamp cats $75. Sales Price $50. Scott #21: Fresh looking stamp. Nice copy of this 1860 issue. Stamp cats $100. Sales Price ask. Scott #26: Nice copy of this 1861 item. A couple of short perfs. Stamp cats $67.50. Sales Price $30. Scott #27: Nice color and perfs on this 1861 copy. This is the rose color variation. Stamp cats $190. Sales Price $140. Scott #31: Good color and clean design on this 1862 stamp. Perfs are cut close, which is typical since they were printed close together. Stamp cats $45. Sales Price $32. Scott #32/Mi23i: Other than a couple of short perfs on the right, this is a very fresh stamp. Stamp cats 800DM. Sales Price ask. Scott #34: A number of nice copies with good color. Some have all perfs intact and others do not. All are used. Stamp cats $12. Sales Price ask. Scott #36: Various items of this rose color stamp. Nice copies. Stamp cats $3.75. Sales Price $2. Scott #36a: This is the deeper red issue (claret) of this 1863 stamp. A nice copy of a hard to find item. Stamp cats $2251. Sales Price $170. Scott #37: A number of copies of this 1863 issue in various condition are for sale. Stamp cats $52.50. Sales Price ask. Scott #39: A very nice copy with a few short perfs. Tough stamp to find. Stamp cats $190. Sales Price $110. Scott #40: A gem. Very nice perfs on this key valued stamp. Stamp cats $375. Sales Price ask. Scott #41: Nice mint copy with good margins and color. Stamp cats $37.50. Sales Price $25. Scott #41: Some 4 margin copies of this inexpensive stamp. Stamp cats $7.50. Sales Price $4.50. Scott #42: Various examples with nice bright color and good roulette and cancels. Stamp cats $2.75. Sales Price $1. Scott #45: Nice big margins all the way around on this stamp. Stamp cats $100. Sales Price $75. Scott #46: A very hard to stamp to find. This one is priced very nicely. Check it out. Stamp cats $1150. Sales Price $300. Scott #47: Very clean copy of this 1869 item. Stamp cats $27.50. Sales Price $17. Scott #49: Very sharp looking. Stamp cats $12. Sales Price $8. Scott #50: Very nice copies of this stamp all the way round. 2 copies for your chosing. Stamp cats $20. Sales Price $11. Scott #50 Mint: Cut at the top, otherwise a very nice stamp. Stamp cats $60. Sales Price $10. Scott #51: Very nice centering and color on this issue. VF sums it up. Stamp cats $45. Sales Price $32. Scott #52: A nice copy of this issue. Good margins and cancel, though part of the lower margin is cut close. Stamp cats $45. Sales Price $32. Scott #52: VF with nice margins and is clean in all respects. Stamp cats $45. Sales Price $36. Scott #54: Nice copies of this stamp, though all are close on one side. Stamp cats $45. Sales Price $30. Michel #57b: Interesting stamp with some small perf faults. Stamp cats $179DM. Sales Price $40. Scott #62: A nice copy. One pictured has good perfs, one not pictured with a few pulled (sold at a discount, ask for details). Stamp cats $12.50. Sales Price $6. Scott #64: Very clean item (smudge on bottom). Stamp cats $5. Sales Price $2. Scott #65: Nice clean mint stamp. Stamp cats $8. Sales Price $3. Scott #65: Nice color and perfs on this used item. Stamp cats $8. Sales Price $4. Scott #66: Nice grey color and hosts one of the nicer cancels from the area. Stamp cats $45. Sales Price $32. Scott #67: Nice inexpensive stamp from this state. Stamp cats $5.75. Sales Price $2. Scott #68a: A VF copy of this high value item from the 1875 set. Stamp cats $65. Sales Price $42. Scott #71: VF copy of this stamp. Stamp cats $10. Sales Price $5. Scott #O101: Offical stamp. Nice cancel and appearance. Stamp cats $5.50. Sales Price $2. Scott #O107: A very nice copy of this hard to find official stamp used. Stamp cats $225. Sales Price $110. There is a growing fascination of forged stamps. More and more auction houses are selling forged stamps with a full catalog valuation. This seems odd to put a full catalog value on a stamp that is not authentic, but it is happening with an increasing frequency. Most of the Internet auctions consisting of German States material has large numbers of forged material and most of it is not documented as such. Listed in this section are some forgeries that we will sale. No sales price is listed but if interested please send email and lets see what deal we can work out. Scott: Bavaria #14: A very nice forgery by Fournier. Cancel looks pretty good (#597 worth 60DM). It is possible that this forged stamp was actually postally used. Authentic copy of stamp cats $125. Scott: Bergedorf #1: A nice type III forgery. Well executed. Authentic copy cats $47.50. Scott: Berdedorf #2: A nicely executed but easily detectable forgery of this stamp. Authentic copy cats $47.50. Scott: Bremen #10: Type III forgery. This is a tough one to detect and hard one for many to admit. Authentic copy cats $300. Scott: Bremen #11: This is a pretty obvious forgery. Authentic copy cats $70. Scott: Bremen #11: This is a bit trickier than the previous example to detect. Nevertheless, this is a forgery. Authentic copy cats $70. Scott: Bremen #13: A well executed type I forgery. The cancel is not as well executed. Authentic copy cats $4000 used and $145 mint. Scott: Brunswick #10: A tough one to call, but this is a nicely executed type II forgery. Authentic copy cats $95. Scott: Hamburg #18: Nice appearance but an obvious forgery. Cancel appears to be an obvious forgery as well. Scott: Hanover #1: A clean copy but an obvious type I forgery. Authentic copy cats $55. Scott: Hanover #5: A clever stamp but does appear to be a forgery. Authentic copy cats $75. Scott: Oldenburg #13: A nice dopy of this stamp. Its a very subtle forgery. Authentic copy cats $175. Scott: Wurttemberg #1: A type II forgery. Authentic copy cats $125. All stamps pictured are guaranteed genuine or we will be more than happy to refund your money.